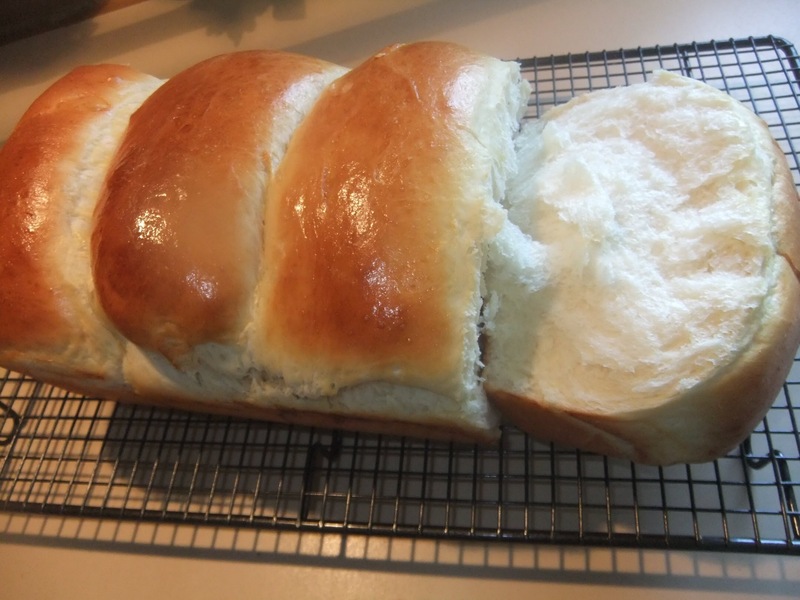 You know- those comforting, mouth watering snow white, billowey little loaves and rolls that are the foundation of respectable Asian bakeries. Mmmm- those soft, squeezable buns. Those pull apart, feather like layers that gently pull away like the wind blew them apart. Ahhhh, the ones just melt in your mouth just like cotton candy. Making this bread at home is work, but worth it. You must begin by starting with a batch of fermentation. This is also called, “Starter” , “Mother Sponge,” or just “Sponge”. In a small heavy bottomed sauce pan whisk together the flour, milk and 1/2 cup of water until smooth. Bring to a simmer over medium-low heat and cook, stirring often until thicken- but remaining pourable, about 8-10 minutes.As it cools it will continue to thicken. Remove from heat and pour into a small cereal bowl and lightly cover the surface with plastic wrap. Set aside to cool to room temperature. This is enough Starter for two batches. Keep 1/2 in the fridge covered but allowed to breath. Feed a bit of flour every few days, mixing in well with any liquid that has accumulated at the top of the sponge. This will keep your starter alive and growing. ½ cup warm whole milk, plus extra for brushing on the unbaked loaf about 90’F. No hotter. 4 Tablespoons unsalted butter, cut into pieces and softened at room temperature, plus extra for greasing proofing bowls and baking loaf pan. In the bowl of a stand mixer fitted with a dough hook, combine the flour, salt , sugar and yeast. Toss together for a few seconds, just until evenly combined. Add the milk, eggs and 1/2 cup of the starter. Turn the mixer on low speed and knead 5 minutes. Add the softened butter and knead another 10 to 12 minutes (it will take a few minutes for butter to be incorporated), until the dough is smooth and springy and just a bit tacky. Lightly butter the inside of a medium sized bowl. Use your hands to lift dough out of mixer bowl, onto a clean dry surface dusted with a bit of flour. Quickly shape into a ball and place in the prepared bowl. Cover with a kitchen towel and allow to rise in a warm place until doubled in size, 40 to 60 minutes. Lightly oil you hands as if you were rubbing them with a tiny bit of lotion. Punch the billowing dough down with your closed fist and then scoop it up in your open hand onto a clean dry slightly floured surface. Using large knife, cut dough in quarters. Very gently form each quarter into a small ball, leave on the clean dry surface covered with a towel and allow to rise an additional 15- 20 minutes. Preheat heat the oven to 350’F degrees. While the oven is coming up to temperature generously butter a 9-by-5-inch loaf pan. Using a lightly flour dusted rolling pin, gently roll the dough balls one at a time into a 8 x 4 inch thick ovals. Careful not to completely remove all the fluffy Co2 gas created by the yeast. Fold the top 1/3 of the oval down, then fold the bottom 1/3 of the oval up, making a rough looking square shaped piece of dough. Starting from the right edge of the rough looking square, roll up from right to left, creating a spiral looking cylinder or log. Place the logs in the buttered pan, seam side down and crosswise, nestling into one another. Cover again for the last rise. Allow the formed dough to rest 30 to 40 additional minutes or until the dough has risen and is peeking over the edge of the loaf pan making sure the and the dough logs are meeting and connected. Brush the tops with milk and bake on the bottom shelf of the oven on a sheet pan until golden brown and puffed, 35 to 40 minutes. Allow to cool, remove from pan and …. pull apart ! Mmmmmmm. Shark 🦈 food for sure Pat!